Question for Toyota: Will the Prius look "evolve," or "really evolve"? LOS ANGELES (Bloomberg) -- Toyota Motor Corp., closing in on record global sales of Prius models, is studying whether to keep the hybrid line's aerodynamic wedge-shape as the automaker designs the next-generation of the car. "There's an undercurrent among most people that they're ready for a new Prius look," said Chris Hostetter, Toyota's U.S. group vice president for strategic planning, who's working with Toyota engineers on the redesign. "Maybe our architecture has been a little bit similar for the last two generations." While the carmaker hasn't yet selected a look from "a menu to choose from" for the next Prius, "one of the avenues we're exploring right now is to evolve it, and the other is to really evolve it," Hostetter said in a phone interview last month, without elaborating. The redesigned Prius will arrive in the spring of 2014, Automotive News, a sister publication of Automotive News Europe, reported in July. Toyota's push to broaden Prius's appeal coincides with record deliveries of gasoline-electric cars bearing that name this year, and its top sales rankings in markets including Japan and California. Stricter U.S. fuel-economy rules and tougher hybrid competition from Ford Motor Co. and Honda Motor Co. are also spurring Toyota, which has led the segment for 15 years. Global Prius sales -- including the main hatchback, V wagon, plug-in model and subcompact Prius C, sold in Japan as the Aqua -- surged to 691,281 this year through September, 60 percent more than the total for last year, according to figures provided by the company. The previous Prius sales record was 509,399 units in 2010, when Toyota offered only the hatchback. "Up to now the shape they've had was perfect for that product; it was distinctive and said, 'This is a hybrid vehicle,'" said John Wolkonowicz, an independent analyst in Boston who specializes in automotive history. "But it also appealed to only a certain type of buyer. It's time to move to a broader market." The first Prius, initially sold in Japan in late 1997 and three years later in the United States, was more technical curiosity than sales success. While the car's nickel-metal hydride battery pack and motor were exotic for a mass-market car at the time, the appeal was dulled by an exterior design modified from Toyota's Yaris sedan. Not until Toyota restyled the Prius in late 2003, giving it a raked hood and windshield that flowed seamlessly into the roof line, did it begin to sell in large volume. In 2004, the first full year the second-generation car was available, worldwide Prius sales jumped to 125,742, almost triple the 43,162 delivered in 2003. Sales expanded through 2010, until Japan's earthquake and tsunami in 2011 temporarily slowed production of Prius models. "I'm very envious of that shape," said Tom Semple, a veteran designer who led Nissan Motor Co.'s U.S. automotive studio until retiring in 2003 and began his career with General Motors in 1967. "That's the kind of thing I started out drawing in the '60s, but GM's engineers would never do." The appeal is "beyond the triangular shape," Semple said. "It's that you've got a windshield that's integrated into a shape that just keeps going." The shape also cut wind-resistance drag, helping Prius boost its fuel economy to 50 miles per gallon in combined city and highway driving, still the highest rating in the United States for any non-rechargeable auto. The look was later mirrored by Honda with its revamped Insight hybrid in 2009 and GM's plug-in Chevrolet Volt sedan in 2010, Semple said. "The second-generation Prius shape is one of the most iconic of the past decade," said Ed Kim, an industry analyst at researcher AutoPacific Inc. in Tustin, California. "To move away from that wedge shape is very significant." Jim Lentz, Toyota's U.S. sales chief, who began promoting the creation of a line of Prius vehicles beginning in 2006, said the car's current profile remains the best option. It has been one of the brand's more innovative designs and has made the car so recognizable that it attracts a range of buyers and has had remarkable staying power, he said. "That's still the best aerodynamic shape," he said in an interview on Oct. 30. "Could there be some morphing of that? Based on new aerodynamic trends, there could be." He added, without elaborating, that "my sense is, well into the future, it will still be close to that iconic look." The next version of Prius has to retain a lead in fuel-efficiency among mass-market vehicles as its appearance evolves, Hostetter said. The car is also going to have better driving "dynamics," reflecting President Akio Toyoda's directive that the company build more exciting vehicles, he said. "We are emboldened to make a much different, much better Prius," Hostetter said. "The consequences of that so far have been, I would say, dramatic." Toyota is still reviewing clay-model prototypes for the next Prius, Hostetter said. Along with a more "emotional" exterior design, a revamped version of Toyota's hybrid system is being readied for the next-generation Prius, he said. Hostetter and his team in the United States are working directly with Satoshi Ogiso, Toyota's chief engineer for the Prius line, hybrid vehicles and plug-in hybrids. Hostetter declined to say whether Toyota would continue to use nickel-based battery packs as the primary energy storage system for the Prius, or move the lineup to lithium ion or another battery chemistry. Automotive News has said the Prius will likely move to lithium ion. To hold down production costs, Toyota is developing a new "modular" platform to serve as the underpinnings for the next Prius and other models, Hostetter said, without elaborating. "Prius is really the launch of that whole new architecture," he said. At the Detroit auto show in January, Toyota showed a plug-in hybrid prototype, the NS4 sedan, that has elements of the new platform, he said. Likewise, some concept vehicles being studied for Prius share similarities with the NS4, he said. "It was a study to show more emotional design," Hostetter said. "Some of the Prius clays we have right now, some of them are more advanced than that. Some of them aren't." Sales growth for Prius models in the United States and Japan accelerated with the creation this year of a "family" of vehicles, and that may be expanded further, Hostetter said. "We're always working on new types of fuel-efficient things, and whether they would be called a Prius or not is always an interesting topic of discussion," he said. "I personally would like to see more vehicles in the Prius lineup." That could even include the hydrogen fuel-cell sedan Toyota plans to sell to retail customers in the United States, Japan and other markets by 2015, he said. Toyota has said that by the end of the decade, Prius may surpass Camry and Corolla to become the carmaker's top-selling vehicle line. A new look can help increase sales, Wolkonowicz said. The design is "frankly a little too whimsical," he said. "I could call them 'dweeb-mobiles' -- a design that's off-putting to a lot of people," he said. "The Prius could be described in some ways as overly cute. I think it needs a little snarl, a little muscle." As Toyota deliberates the future of Prius, competitors are taking aim at gaining sales in different segments of the hybrid market. Ford sold 3,182 C-Max in the United States last month compared with 2,769 for the Prius V, Ford said in a Nov. 2 statement. 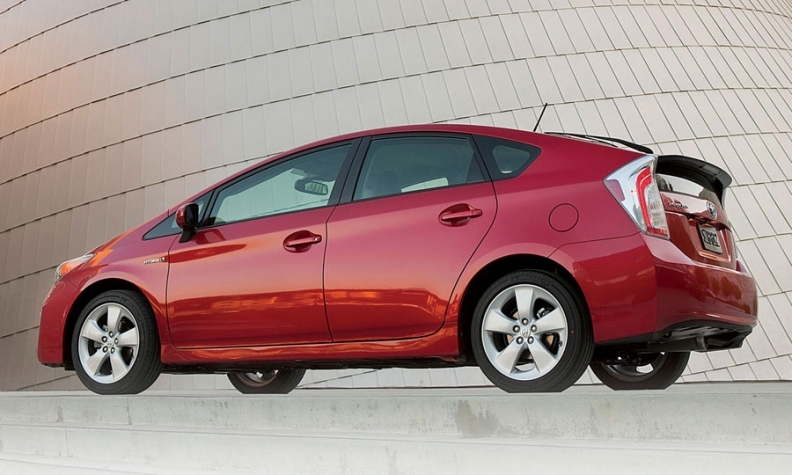 The full Prius line had sales of 16,774 for the month.